Built in the late 1970’s, the Littauer Library is centrally located within the Harvard Kennedy School Littauer Building. The Littauer building also houses classrooms and offices that were designed to encourage interaction between the students, faculty, and administration. 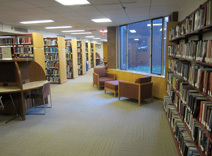 The library is located on the first floor and primarily serves the research purposes of students, faculty and staff of the Harvard Kennedy School and the surrounding Harvard community. The library collection covers issues confronting government today including international affairs, social policy, the economy, national security, the environment, the electoral process and more with an emphasis on public policy and management in the public and nonprofit sectors. In addition, the Littauer Library is committed to supporting the knowledge growth of the Harvard Kennedy School and hosts a Speaker Series and library training sessions.